There's a new trailer for Superhot. Sorry, I mean SUPERHOT. Sorry, I mean SUPER. HOT. SUPER. HOT. SUPER. H—and, once again, it's another super exciting video showing off more time-dilated manshooting, gunchucking and abstract violence. It's like F.E.A.R. meets Frozen Synapse! Sort of! "Ladies and gentlemen, we’re hyped to announce that the beta has just been sent out to everyone eligible! Thank you one more time for your awesome support and trust, for spreading the word of SUPERHOT and for all the love we got from you! This is a great day for us, and I hope it will be a great day for you too, once you find the SUPERHOT beta steam-key in your email inbox and activate it in the steam app! "Take your time and enjoy it! And once you're done, let us know if you liked it! Either by sending us an email, tweeting or on the secret backer forum. Also, feel free to post screenshots / videos of the beta if you'd like to, we're cool with that. "Note that the beta is limited, we only send it to the people who pledged the $40 tier and above. We’re a bit shy to release an unfinished game, but were doing it exclusively for you! There is no way to “buy into” the beta." There's a playable prototype available on the site if you didn't pledge that much (or at all), but it's a bit basic compared to the footage above, and doesn't look nearly as nice. 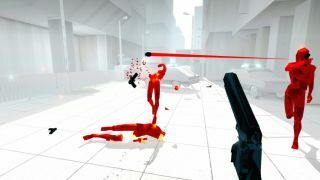 Superhot doesn't yet have a release date, but it's coming, and it absolutely will not stop, ever, until you are dead.